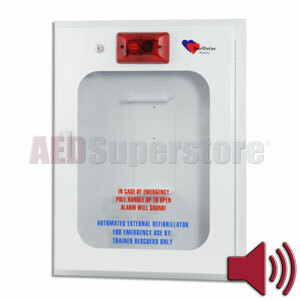 HeartStation Standard Size Semi-Recessed Mount AED Cabinet with Audible Alarm and Strobe Light. This standard size cabinet is perfectly sized for AEDs like the Cardiac Science Powerheart AED G3. Also, this cabinet has room for additional accessories such as spare electrode pads or a first aid kit. This sturdy, metal construction cabinet protects and prominently displays your AED. Mounting bracket inside the cabinet is designed for your specific AED. Door-activated alarm and flashing strobe light alert everyone the AED has been deployed for rescue.